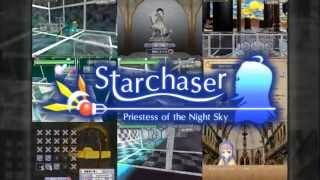 Starchaser: Priestess of the Night Sky on the Playism Store | Bringing a different breed of indie game to the world. jump, leap, shoot, and dodge! "Starchaser: Priestess of the Night Sky" is a 3D action game with gravity in every direction. "Priestess, raise thy voice in prayer." There is no concept of up or down in Starchaser: Priestess of the Nightsky. If you get close to a Gravity Floor (looks like ), you can stand on any surface, and seemingly impossible routes become traversable if you switch the direction of gravity. In Starchaser: Priestess of the Nightsky, you will come up against enemies that block your way, such as the labyrinth's residents and lords, but the concept of using gravity to your advantage is even more important. "If we are going to create any 3D games, we definitely need to utilize 3D function into the game!" Starchaser was born when I thought about how I could create a new 3D game with this is mind. Most 3D indie games are actually confined within the 2D structure as same as our reality. Maybe this is due to the existence of gravity... On the ground, we can move forward as much as we want, but we can never reach anything even 5 meters high. "It is no use to confine ourselves on the ground when we create 3D games!" ...so I came up with the most coolest game that a character was running around on the wall, ceiling or anywhere. Finally we realized that the fundamental rule about "things drop down" is really important, and freeing the character from the gravity deprives the all the fun brought down from that rule. We'd love to see you going through this gravitational dungeon using your own wits and technique. What do you think about Starchaser: Priestess of the Night Sky? "Nonlinear" is the Dojin circle from Tokyo university created to help foster group-creation.Our current project is working hard to create great quality games as soon as possible for our eager fans.Our "HQ" is on the Komaba campus but students from other universities are also working together with us to ensure that we can make the best games possible!Please visit our homepage for more details.